Dry skin is a huge inconvenience, no matter the causes behind it and regardless of the extent of the affliction. While this ailment rears its heads in different areas of an individual’s bodies, can be affected by environmental factors, and may respond differently to alternate treatments, it’s undoubtedly something that everyone wants to get rid of – and fast! – when it becomes an issue. 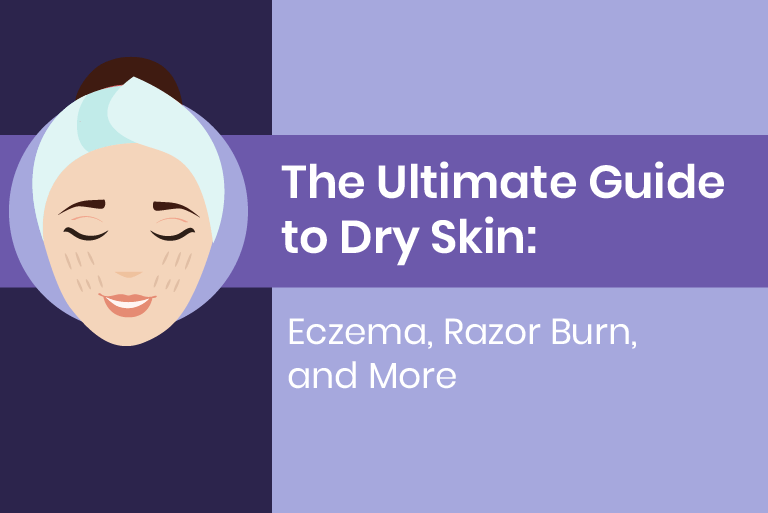 Keep reading to learn about why dry skin occurs, what can trigger it, how to treat it, and how to deal with the other ailments that are known to accompany it. Before we get into the factors that cause dry skin, let’s talk about the science behind it. Our skin is a water-containing barrier that protects us from the elements, although the amount of moisture held in each individual’s skin varies. This can be different from person-to-person depending on gender, age, and even by body part. As you probably know, our skin is porous, which allows moisture to exit the skin through evaporation. Conditions or actions that accelerate this water loss process, which we’ll delve into below, results in dry, flaky, itchy, and even unsightly skin. Dry skin can be caused by a range of factors. Some of them are environmental and hard to avoid, while other causes can be easily mitigated. Have you ever noticed that winter is almost always accompanied by dry and itchy skin? It’s not a coincidence! Because the humidity level tends to drop during the cold winter months, it hastens the speed of evaporation of the moisture in your skin. Skin loses over 25% of its ability to hold moisture in the winter, and this number only increases if you live in a particularly windy area or if you enjoy winter outdoor sports. Indoor heating is another issue that comes up in the winter that contributes to dry skin. Being exposed to indoor heating dries out your skin as well as your mucous membranes, which leads to chapped lips and dry noses, too. While the past two contributing factors to this condition are environmental, this is something you can more easily control! Even if you don’t feel thirsty, your skin is losing water. Since our bodies are 70 percent water, we need adequate hydration to feel good and for our skin to stay hydrated, supple, and healthy. This dry skin culprit may seem counterintuitive, as taking a long soak in the bath would be thought to add moisture to skin, right? Unfortunately, this does just the opposite. Hot water and soaking strips your skin of protective oils, leaving you feeling scaly and dry. Dry skin can occur with different levels of severity. While some may simply acquire dry skin patches that can be easily resolved, others may have a condition that evolves into eczema in its various forms. In this section of our comprehensive guide, we’re talking about treating dry skin conditions at every level! If you’re facing dry skin, it’ll be obvious. Your largest working organ will appear to be rough and scaly–typically in patches–and these areas will be itchy and flaky. While this ailment is totally annoying, it can be treated relatively easily at home with a bit of effort and diligence! The most obvious, and perhaps the easiest, way to ward off dry skin is to moisturize regularly, particularly when your skin is still damp from a shower. This is because your skin will be plump with moisture, and lotion will act to lock in that moisture before it evaporates. One remedy is to practice a so-called “overnight cure”. Soak in a bath of lukewarm water until your fingers are pruny. Pat until you’re semi-dry when you emerge from the bath and apply a layer of oil – even one as simple as something found in your pantry, like Crisco shortening. Put on an old pair of pajamas (and ensure you have old sheets on your bed) and go to sleep, letting your skin drink in the moisture of the oil and wake up feel soft all over! Another remedy for mild to moderate dry skin is to use supplements. Fish and flaxseed oils contain essential fatty acids (EFAs), which are known to keep your skin hydrated. Supplement your diet with fish and flaxseed oil, especially in the winter months that exasperate dry skin, to ward off this irritation. As mentioned, more severe forms of dry skin manifest themselves in conditions like eczema. But what are the differentiating symptoms of this condition and how is this ailment treated? Find out below. Eczema is a common condition as over 30 million Americans struggle with it, according to the National Eczema Association. Eczema symptoms differ from one person to the next, but typically this condition is very itchy, sometimes the irritation results in red and inflamed skin or even bleeding. Dark colored patches of skin, rough, leathery scaly patches of skins, swelling, and oozing or crusting are all eczema symptoms. However, remember that all of these symptoms don’t need to be present for dry skin to be classified as eczema. In fact, eczema symptoms tend to come and go and cause those afflicted with the condition to experience “flare ups” depending on environment and other triggers. Eczema is not curable, but it can be managed with regular treatment. While more severe cases may require medications prescribed by a doctor, over-the-counter medicines may be helpful for other cases. Alternatively, the best ways to keep eczema at bay are to know what may trigger your eczema specifically and avoid those triggers and implementing a regular bathing and moisturizing routine. Regardless of the severity of dry skin that you experience, this ailment may be accompanied by a range of irritants that exasperate it. To complete this guide, we’re delving into those below so you know how to cure or avoid these tricky situations as you navigate the waters of dry skin. Razor burn is irritating no matter what the overall condition of your skin may be, but it’s especially hard to deal with when your skin is already dry, flaky, and itchy. This is because razor burn makes skin even more irritated and itchy. For that reason, you’ll want to avoid this annoyance at all costs, even more so when your skin is dry. To do so, always save shaving for the last step of your shower, as it ensures that your hair follicles are softened. Also, exfoliate your skin thoroughly before you shave to allow for a closer shave without being too harsh on your skin. Moisturize with an over-the-counter product shaved skin right when you get out of the shower to cut down on the chances of razor burn. Acne is another skin irritant that is tough to deal with on top of already dry skin. Having the two ailments together can be dumbfounding, as excess oil is what’s said to cause acne, yet dry skin feels completely devoid of all moisture, including oil. So what gives? Excessively dry skin may cause your skin to over-produce oil to compensate for what it’s missing, thus clogging pores and leading to pesky and unsightly breakouts. Since these ailments can coexist, you have to find a balance between treating dry and delicate skin and treating breakouts. First, find products with the right ingredients. Moisturizers with help control blackheads while zinc keeps your skin balanced and works against the possibility of an over-production of oil. Understanding dry skin, its treatments, and the different levels of severity that accompany the ailment is the first step to ridding yourself of it for good. Remember that practicing normal moisturizing routines and avoiding environmental factors that contribute to these conditions is key. Allow this guide to be a helpful reference in your journey to soft, touchable, and comfortable skin all year round!